Genuine OEM Panasonic Drum Unit, Black, 59,000 page yield. 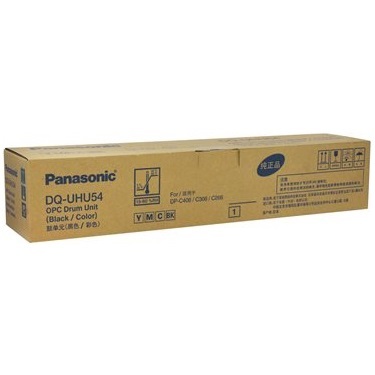 Panasonic part number: DQ-UHU54, DQUHU54. Drum Unit compatible with Panasonic Workio DP-C266, DP-C306, DP-C406. Genuine OEM Panasonic Toner Cartridge, Cyan, 20,000 page yield. Panasonic part number: DQ-TUV20C, DQTUV20C. Color Laser Toner Cartridge compatible with Panasonic Workio DP-C265, DP-C305, DP-C405, DP-C406. Genuine OEM Panasonic Toner Cartridge, Magenta, 20,000 page yield. Panasonic part number: DQ-TUV20M, DQTUV20M. Color Laser Toner Cartridge compatible with Panasonic Workio DP-C265, DP-C266, DP-C305, DP-C306, DP-C405, DP-C406. Genuine OEM Panasonic Toner Cartridge, Yellow, 20,000 page yield. Panasonic part number: DQ-TUV20Y, DQTUV20Y. Color Laser Toner Cartridge compatible with Panasonic Workio DP-C265, DP-C305, DP-C405, DP-C406. Genuine OEM Panasonic Toner Cartridge, Black, 28,000 page yield. Panasonic part number: DQ-TUW28K, DQTUW28K. Laser Toner Cartridge compatible with Panasonic Workio DP-C405, DP-C406. Genuine OEM Panasonic Waste Toner Container, Black, 28,000 page yield. Panasonic part number: DQ-BFN45, DQBFN45. Waste Toner Container compatible with Panasonic Workio DP-C262, DP-C263, DP-C264, DP-C265, DP-C305, DP-C322, DP-C323, DP-C354, DP-C405, DP-C406.